A nice blend of flavor: Bacon, Sour Cream, Chives and Cheddar Cheese all in one Potato Chip. 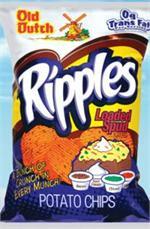 We've topped ourselves again by loading every ripple with spud toppings. Loaded with cheddar cheese, sour cream, bacon, and chive flavors, every ripple in these chips is full of a hearty baked potato flavor. Their bold flavor makes Old Dutch Loaded Spud Ripples the perfect chip for any occasion.